Sometimes a lack of motivation in business isn't a day-to-day issue. It can be an ongoing problem for weeks or even months. You lose your passion for your work... for writing. There are plenty of reasons this might happen. Maybe your freelance writing niche is wrong for you. Perhaps you aren't earning enough to feel like the time spent on your business is worthwhile. Or maybe you feel like there's no purpose to what you're doing as a writer. Sometimes having a greater purpose is exactly what we need to pick ourselves up, focus on writing, and reach new heights in our businesses. One way you can do that is find a way to tie your work as a writer to doing good for someone else. "Doing good" motivates more than writers. Before I went into business for myself, I worked for a major international nonprofit famous for some of its fundraising events. Each regional office played a role in those, especially those of us in the larger city branches. On top of that work we had our own events and fundraising to do. And again, being in a city office, we tended to run major events, like charity auction galas. A significant part of my job was fundraising. And while the team I supervised handled things like soliciting individual donations, my job was more about reaching out to CEOs and other industry leaders for larger donations and to get them involved in big events. I hated fundraising. With every fiber of my being, I hated doing that job. But I quickly became good at it. I became a bit of a "fixer" in the office. You couldn't get a major company's CEO to take a call? I could work their secretary in a way that I'd have a direct line to the head honcho within the hour. Needed an absurdly-expensive item donated for an event, but no local stores that sold it were authorized to donate that much (or physical items at all) to an individual charity? I bypassed those store managers and had the district manager for a major chain do the hard work for me. I sold one person on the idea. And she ordered every manager in her district to donate the maximum dollar amount they were allowed in gift cards. Then my boss could go to one of their stores and get what we needed even though it couldn't be donated directly. You needed a local company to donate something valuable for a gala's silent auction, but nobody would bite? You'd toss it to me and tell me it was impossible. I'd make it happen just to prove you wrong. In one case like this, by the end of the week I had two jewelers "outbidding" each others' donations for the PR value and bragging rights at the event. How? I found pairs of stores in close proximity to each other and narrowed it down based on their marketing. These two were privately-owned (not big chains with strict policies on charity involvement). And they had a nasty habit of targeting each other directly. So I played their egos like a fiddle. If something difficult had to be done as far as fundraising went, I was your girl. But I still hated it. I didn't devote myself to work I couldn't stand just because it was my job though. I actually couldn't wait to leave the politics of the nonprofit world behind. I got good at that job because I cared about the cause. It wasn't about fundraising, or event planning, or PR. It wasn't even about the organization. It was about doing good for the people we were there to help. And when you make it about someone, or something, you care about even more than yourself, it gives you extra incentive to think outside the box and find a way to make things happen. "Doing good" motivates artists too. When I left the nonprofit world to launch my business -- music PR at the time -- I saw similar motivation in some of the artists I worked with. One of my favorite things to do with regional bands was to have them avoid the routine music marketing everyone did -- blasting social media followers and posting flyers around town before a show for example. I tried to teach my clients that good PR was infinitely more valuable than basic marketing. They had to do something that was actually worth talking about if they wanted to build buzz and grow a fan base. That didn't mean acting like publicity whores or pulling cheap stunts. For my clients, that meant doing good -- doing something to benefit their communities, something the media would care about. Once they saw what real media coverage felt like and could do for them, they never went back. It was about more than the publicity though. I remember watching some of those guys absolutely transform. Guys who didn't used to buy Instagram Likes and to take their gigs seriously were suddenly gung-ho businessmen organizing their own charity shows (with my help, but they were always very involved and excited to bring their ideas into the mix). Suddenly, they weren't afraid to ask for more money from venues (because it was for something bigger than themselves). And they'd push their own album and merch sales harder than I'd ever seen because they were donating a portion of all sales and never felt like they were doing enough. They wanted to work harder. So they did. They were motivated. They had a purpose beyond just having fun and making a few bucks. And when they genuinely cared about what they were doing, because they were doing good for others, they did more for their own careers than they ever had before. Writers can do great things by "doing good" too. If you're struggling with your writing business these days, perhaps finding a greater purpose will get you back on track. There are plenty of ways you can tie your writing to a cause or some greater good. Need some examples? Donate a portion of book sales to your favorite charity. Write a blog post about a cause or organization you care about. Instead of a self-serving call-to-action, send readers to a website where they can donate to that cause. Volunteer your copywriting skills for a local nonprofit organization you care about and would happily volunteer for anyway. Use a book or blog to raise awareness about an issue you care about (such as a health condition you or a loved one suffers from), whether or not there's any fundraising involved. Set a donation goal for a cause you want to support that year. Then decide to set aside a certain percentage of your writing income until you've saved enough to make that larger donation. Stay motivated and focused on your work and you'll reach that goal, and that money can start helping someone, sooner. It doesn't even have to be a nonprofit organization. Put your writing behind helping an individual in some way if you can. If someone else is relying on you -- whether you're coaching someone or working with a mutual accountability buddy -- you might feel more motivated to get the job done than you would if you were the only person benefiting. Heck, even negative motivation could work here. For example, set aside a certain amount of money ($50, $100, $500 -- any amount you could afford to lose, but still enough to be significant enough that you'd miss it). Give it to a friend you can trust, under strict instructions that if you fail to meet a goal you've set, they'll donate it to a cause you've specified, in your name. Make it a cause you despise (perhaps an opposing political party). In that case the motivation comes less from doing good and more from you wanting to prevent yourself from contributing to a cause you find repulsive in some way. 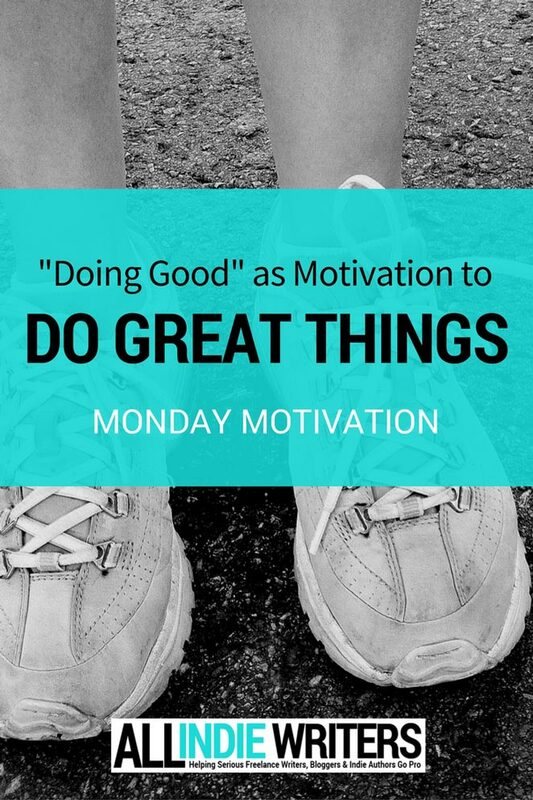 "Doing good" can motivate you to do anything. This post was inspired by a recent comment here on the blog from friend and fellow freelance writer, Cathy Miller. That was when she mentioned the Susan G. Komen 3-day Walk for the Cure -- a 3-day, 60-mile walk she does every year to help raise awareness and funds to support breast cancer research and programs. Cathy just finished her 13th event last month. And she's a perfect example of what you can push yourself to do when you'r working towards something bigger than yourself. "When I took that first step back in 2003 as a walker for the 3-Day, 60-Mile Walk for the Cure, I had no idea of its lasting impact. What started as training walks for the event evolved into daily walks for better health. 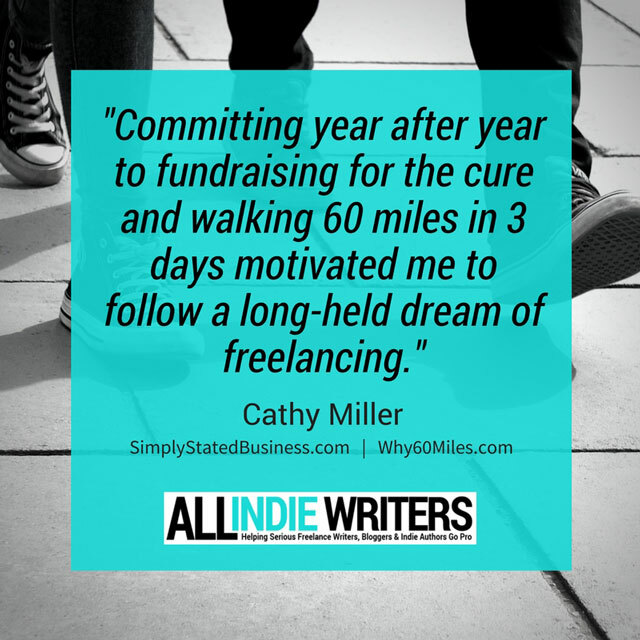 As I write this, I also realize committing year after year to fundraising for the cure and walking 60 miles in 3 days motivated me to follow a long-held dream of freelancing. How can you not be inspired by survivors who demonstrate so much strength? Life is for living." Beautifully put Cathy! We all have to find inspiration where we can. And sometimes the most powerful motivation comes from what we can do for others -- especially those who inspire us to give back, do more, and be better. If you'd like to learn more about Cathy's passion for the 3-Day Walk, read her blog about the event at Why60Miles.com. Do you find motivation for your writing by getting involved with events, organizations or causes you care about? I hope you'll share your stories. I'd love to hear what inspires you! Thanks for the shout-out, Jenn. I am humbled by your kind words. I love your examples from your nonprofit work. Something else we share – I hated fundraising, too. But what an eye-opener that has been. I had no idea how many people have been affected by cancer until I began hearing their very personal stories through my fundraising. I realized this was not about my discomfort in asking for money. It was honoring the memory and the battle of anyone touched by this insidious disease. And I have to thank you for bringing me an insight I had never really thought about before. I wanted to leave the corporate world for some time. I had researched and kept thinking, “I’m going to do this.” But I was afraid to pull the trigger. My participation in the 3-Day event has taught me many things. One such lesson was I could do much more than I ever thought I could. That realization helped me make the leap from the corporate world to freelancing. I have never looked back. I encourage everyone to find what motivates them. Look outside yourself. You may be surprised what you find. Thanks again, Jenn. Thanks for the mention, Jenn. It feels good to speak out about the things that matter, and I agree that giving back to others can be incredibly motivating. One of my volunteer gigs is managing a website and social media for a local complementary health organization. In addition to the feel-good factor, I’ve ended up benefiting by having another place to test out strategies. That’s another great point Sharon. Sometimes volunteer work gives us more flexibility to play with new ideas. And for newer writers, it can be much-needed experience (and far more valuable with a respectable organization in your portfolio than taking on cheap gigs for no-name clients).